Forklifts are massive machines that are capable of moving thousands of pounds, which is why there is no excuse for failing to maintain them properly. The Chicago forklift accident attorneys of Rosenfeld Injury Lawyers LLC are committed to holding companies responsible when their attempts to cut corners at the cost of worker safety result in catastrophic harm to employees. One of the simplest ways that employers can reduce the risk that their employees are involved in forklift related accidents is to make sure that the machinery they use is always in top working order. There are countless systems in play whenever a forklift is in operation and a multitude of things that can go wrong. From a leaking or faulty hydraulics system to improperly inflated tires, the impact of poor maintenance practices can place workers in grave danger. Even worse is that some employers deter their employees from pointing out maintenance issues or refusing to work on machinery that has mechanical issues. Our Illinois forklift injury lawyers believe that there would be far fewer workplace injuries if employers would take the time needed to address the problems with their machines, but the need to reduce overhead often results in the neglect toward these concerns. Some of the accidents that can result from poor maintenance include the following. Tipover or rollover accidents. When the hydraulics system fails while lifting or lowering a load, it can shift the forklift’s center of gravity and cause it to tip. Poorly inflated or defective tires can also shift the weight of the machine and cause it to tip or roll when making turns. Falling objects/debris. When a load shifts while it is being elevated, the contents could come crashing down on the driver or immediate bystanders. 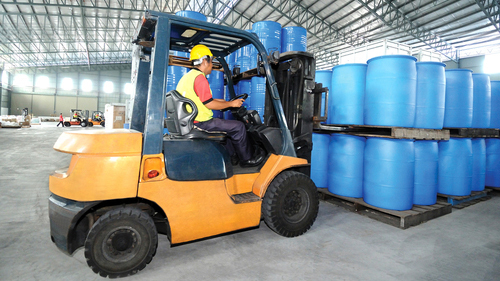 In many cases, faulty hydraulics systems can result in the failure of the forklift to stabilize the weight of the load. A worker is crushed by a forklift during a tipover event. Employers are required to install devices designed to keep workers inside of their forklifts during an accident, but they often do not provide or maintain this equipment. In addition to being injured by poorly maintained equipment, workers may suffer injuries due to manufactural defects or repetitive use. Our Illinois forklift injury attorneys have tried cases in which workers were forced to take time off due to injuries that resulted from the impact of years of vibrations and repetitive motions that required clients to undergo surgery to repair muscle and nerve damage. It is important to know that even if you cannot prove your employer is at fault for your injuries, if you can make the case that you suffered the injuries due to performing your regular duties, you will be entitled to receive workers’ compensation. This benefit will cover the cost of your medical care, two thirds of your wages throughout your recovery and any permanent disability you’ve suffered. Rosenfeld Injury Lawyers LLC specializes in workplace law and defending workers who have been harmed simply because they tried to make a living. If you have been injured in a forklift related accident, our experienced attorneys can help you recover the maximum value of your case so that you can focus on getting well without the stress of mounting medical bills and lost wages. Contact us today to arrange a risk free case review so that we can collect all of the evidence needed to advise you on all of your legal options. Our Chicago forklift accident attorneys are committed to exploring all possible avenues toward collecting damages on your behalf and in order to offer our services to everyone, we do so on a contingency basis. What this means is that you will not be required to pay us upfront and we will only collect a fee if we are able to successfully recover compensation on your behalf.